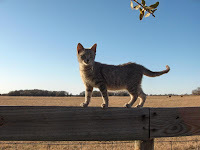 Welcome to Missouri Barn Cat your place to find working cats for barns, stables, warehouses, nurseries and works yards. control facilities. Available cats come from these 7 groups. All member organizations strongly encourages TNR as the best solution for feral cats. We realize that some situations require relocation. If feral cats can not be relocated the only other option is euthanasia. We have found that relocation to a farm, warehouse, shed or horse barn to be the next best option to returning ferals to their original territory. 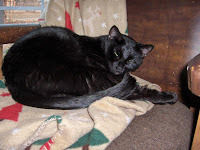 "As a recipient of a lot of the OSF cats that MBC has had, I really appreciate them. I like cats, but pet cats tend to get stepped on by horses, laid on and smothered by cattle, get stepped on by humans - causing falls. Not so with the MBC's - they aren't often seen, some may get close, but not too close! Wonderful rodent controllers so no poisons need to be used, where other critters can become secondarily poisoned should they ingest one that did consume a poison. They do NOT try to dine on poultry either as some tend to occasionally think. This is a great way to control over breeding. Too bad so many still let entire pets out, where they can easily be bred. Thanks to the volunteers, to Metro Animal's OSF and the Doc's who give up their weekends once a month to work at the SOF Clinic! Doing a GREAT JOB! set-up! "I found a mouse in one of my feed cans last week and about had a heart attack from it. I left the lid off the can and the next morning that mouse had become someones food!! They ARE doing their jobs for which I am very grateful. Like I have told you - there is nothing better than the ferals for barn cats - they stay out of my way and do what they are supposed to do and aren't under our feet or the horses either. A perfect set-up! 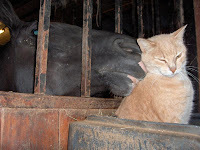 Missouri Barn Cat can place cats into your barn (no less than 2 at a time). Feral cats are use to living in family groups so do much better when placed with other colony members. Four seems to be the idea number for successful relocation from feral colonies but we have placed many more on a single farm with success. We have many adult feral cats available for suitable farm homes. 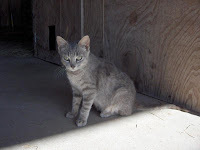 Why should you consider our feral cats (http://www.metroanimal.org/events/main.shtml) for your barns, sheds, and warehouse ? 1. They are feral. The cats released by this program have not been socialized to humans; they are proven hunters, and they will require very little care. They stay out of your way so fewer are harmed by moving equipment. 2. They are sterilized. 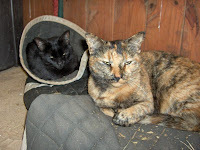 You will not be overrun with kittens and overloaded with feed bills only months after taking these cats into your barn. 3. They have been screened for health problems, immunized with a 3 year rabies vaccine, and treated for fleas. 4. There is no charge for taking these cats. What do I have to do to get a few of these cats ? 1. These cats are feral (semi-wild) and need to live at a farm, horse stable, warehouse, or other suitable locations. These are not available to individuals seeking an outside cat for a residential area. 2. Feral cats are social towards other cats from their original colonies so you must take 2 or more. 3. Your only responsibility will be to provide daily food and water in addition to the rodents they catch, protection from the elements, and long-term vet care. 4. Delivery is available throughout Missouri and Southern IL. "As an ACO for a small municipality, since Operation Sterile Feral has come into my city to help me, my stray kitten and neo-natal population has decreased by over 90%. You can't beat that for "no kill"! Many thanks to All Paws and Metro Animal! for all their animal friendly programs"
Special thanks to Sondra Meyer of College Station, TX for these photos.